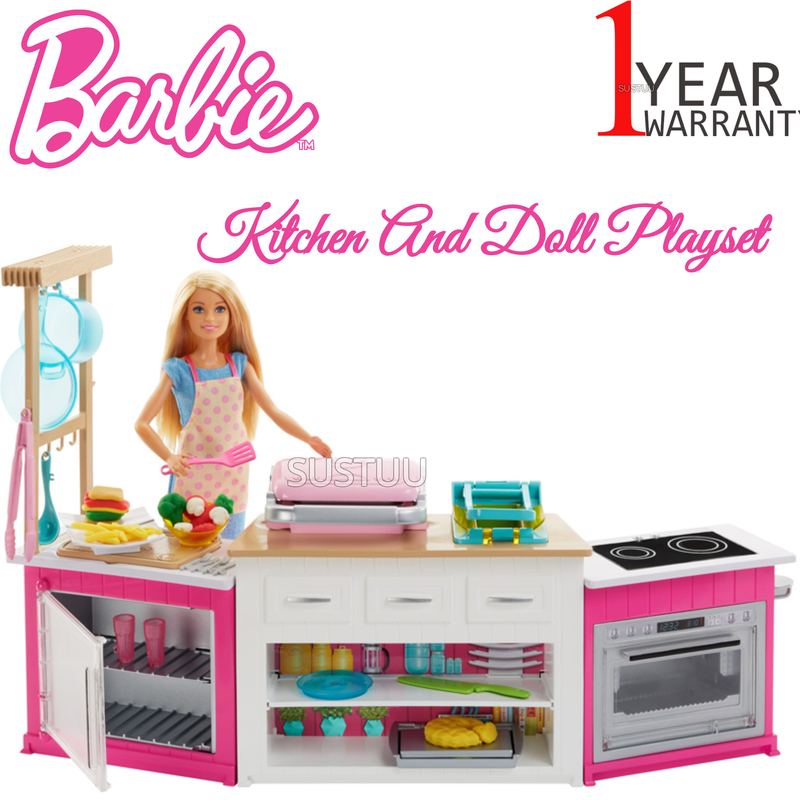 Cook up gourmet stories with Barbie doll and the ultimate kitchen playset! The set includes Barbie chef doll, kitchen counter, appliances, cooking and dining utensils, and five different colors of dough to make food items. Lift up the cutting board to reveal vegetable molds - fill with dough; press down and lift up to reveal veggies that Barbie doll can slice and dice with her knife. To make the perfect sandwich, fill the sandwich maker mold with dough. Place back into the machine and press down the silver handlebar, watch the dough rise, and slide the lever across to slice a delicious sandwich. Cook up a side of fries - drop the yellow dough into the fryer, press the handlebar down (hear the sizzle!) and watch as the perfect batch of fries emerge. "Turn on" the stove to warm the pot and see the stovetop light up red. Don't forget the dessert - simply place the dough into the pie baking sheet mold and slide into the oven. Press the button and listen for the ding! Barbie doll is ready to cook and serve in chef apron and shoes. 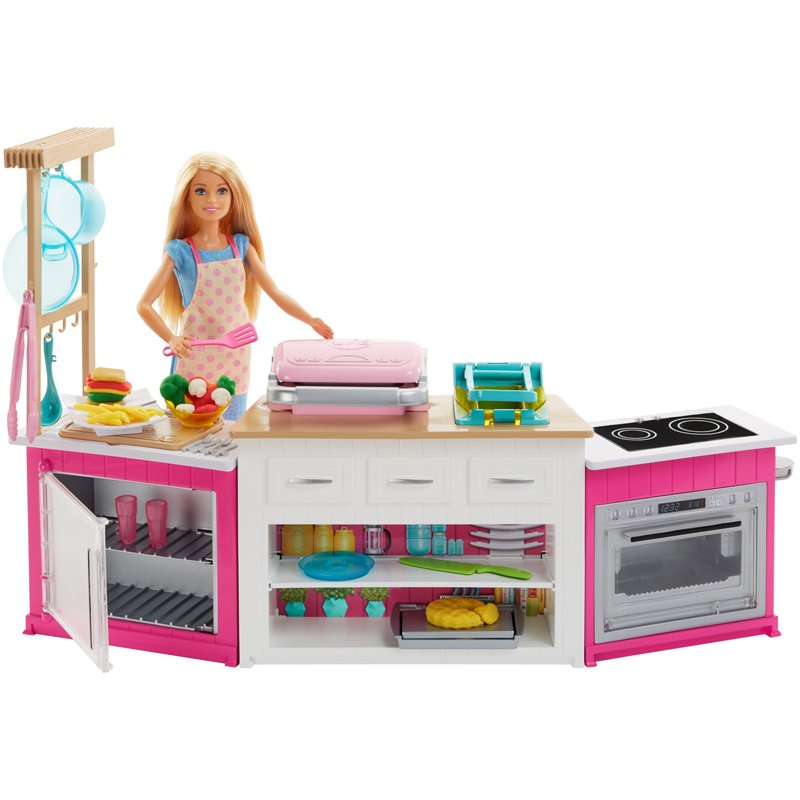 Barbie Doll's Ultimate Kitchen Inspires Young Chefs! 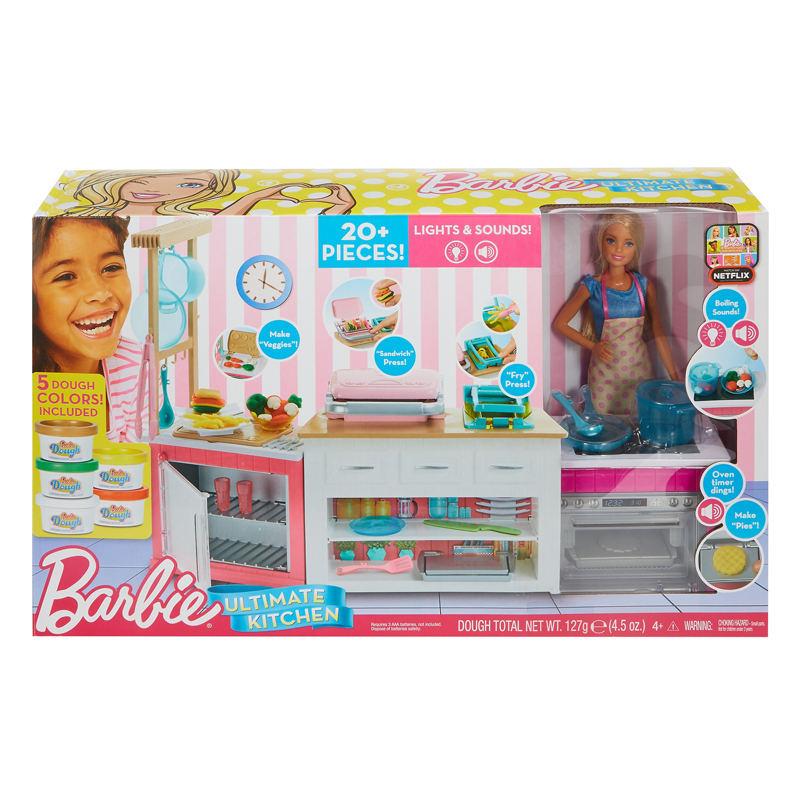 This Barbie kitchen playset is the perfect recipe forplaytime fun with all of the ingredients to cook up imaginative storiesand meals. Lights and sounds add realistic touches. More than 20 storytelling pieces in the kitchen playsetwith lights, sounds, veggie mold, sandwich maker and fry press; plus apie mold, 2 plates, 2 forks, 2 knives, 2 glasses, a bowl, pot, fryingpan, prep knife, a pair of tongs, serving spoon, spatula and 5 doughcolours (white, beige, yellow, orange and green). Small hands will find the working features easy to use. Usethe lever to hear the oven timer ding or push a button to activate thestovetop light and boiling sounds. Fill molds with dough to make a piein the pie mold, french fries in the fry press (it 'sizzles,' too! 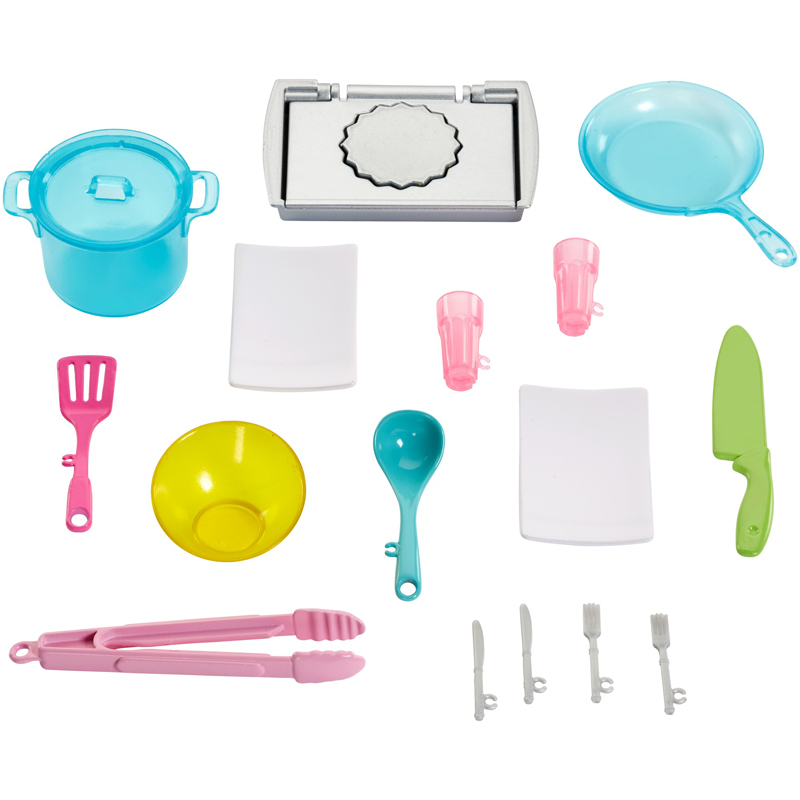 ),sandwich fixings in the sandwich maker and veggies in the veggie mold.Five dough colours let young gourmets cover all the food groups andmake their favourite meals. There are touches of silver and pink, shelving andcabinets, a mini-fridge with working door and hooks to hang cookware. Barbie doll has on a versatile look perfect for whateverrecipe young chefs dream of creating!